Being the grandparent of a multilingual child must be tough at times. As parents, most of us chose to speak more than one language to our child (partly) because that would enable our children to communicate more easily with their grandparents. 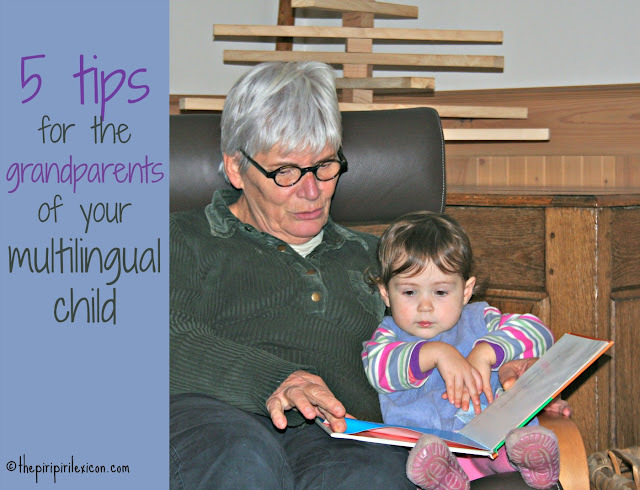 This is especially important if the grandparents are monolinguals. Yet, things don't always turn out the way we want. LJ for example, speaks little Portuguese so far as she has little need for it. When visiting the Portuguese family, she always initially speaks to them in French. She understands most of what she is told and asked but will address them in French. With a little more prompting and encouragement, she will produce a few Portuguese words. Yet these are few and far between. Usually, we don't stay long enough to make a difference to her her language exposure. But most importantly, her Portuguese family speaks English and some French. And to my disappointment, they switch! Despite my P's reminders, they will reply to her in French if she addresses them in French. I can understand their willingness to bond with her, have fun and be liked in the vital few days they spend together. But how is she ever going to learn Portuguese? When we decided to raise her daughter multilingually, we never really asked our parents their opinion. It was our decision and we never really discussed it with them beyond the basics. Raising a multilingual child takes a whole family and network around them. It is not just about the parents and the child. Multilingual families need to involve their family elders and extended relatives (cousins and aunts and uncles). These people may not have read the books and researched the topic of multilingualism as the future parents have done. So, I think it is especially important to explain it to them as best as we can early on in the child's life. Education, education! By education, I don't mean PhD and university degrees. I think the key is to explain to everyone why and how multilingual children are not lagging behind their peers, how if they switch languages, it is normal, how one can acquire more than one language at the time and how lucky they will be to speak or understand all of these languages when they grow up. Show them all of the advantages of being bilingual. This needs to be done in terms they understand and they can relate too. Confusion is a thing of the past! Buy them a book or take them along to a seminar on the topic (many universities have some aimed at the wider public). Do your research to help them. If you say something and you think the child may not have understood, please do not switch: repeat (maybe even twice). If you think they are still not understanding, use gestures, objects, anything that can help. If you know a keyword in the other language, you may use it within something like: "Mama says...". Oh, and also don't pretend you speak the other language if you don't. Kids are clever enough to work this out. it is important to us, as parents, that the child establishes a bond with you in X language. Please do help us in creating a need for the child to speak that language. Switching will not help. Very young children are aware of language much earlier than we think. So It can never be too early. Books, DVDs, music, etc in your language are the best gifts you can send your grandchild/nephew/cousin. It is all part of that need for the language. Of course, age-appropriate games, CDs etc are key. Ask friends what kids in your country like at that age and you have a winner. It is also great for multiculturalism. Birthdays and Christmas sorted for life! If a child does say something to you that you don't understand, please ask us (the parents) and remind him/her that you don't speak that language but that they are very clever and lucky because they can. Maybe they could say it to you in the same language as X. Don't just ignore the child. Remind them how lucky they are to be speaking all these languages. It is important whatever the age of the child. But also remember that they are learning 2 (3 or 4) languages. Things may take a little longer but they will get there. The role of the grandparents and the extended family is about reinforcing the need for their language beyond the parents. At All Done Monkey, Leanna writes about the issues that can occur between grandparents and grand children. Melissa at Where going havo? talks about the emotional cost of bilingualism. Olga, aka The European Mama, explains how multilingualism makes things even harder for grandparents. And Stephen at Head of the heard describes what his mother in law does with their son. This is a great, and timely, article for me as I am going back to see my parents in week with my son. And thanks for linking to my post, by the way. Glad you liked it. Enjoy the trip!